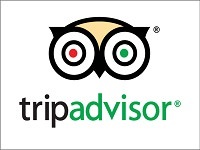 Located in Asakusa is Sensoji Temple, also known as Asakusa Kannon Temple, the oldest temple in Tokyo. 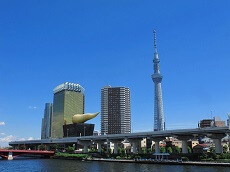 Asakusa is considered old town Tokyo and Sensoji is definitely a landmark of this old town. Nakamise Shopping Street, the area surrounding the temple and its five-story pagoda, has been a tourist favorite for many years. 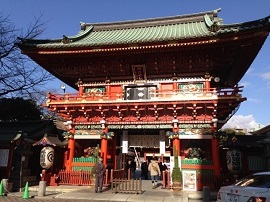 Sensoji is perhaps most recognizable for its monstrous gate entrance with a large paper lantern hanging in the center. 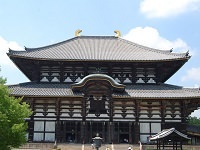 This entrance is the Kaminarimon, which literally translates to Thunder Gate . 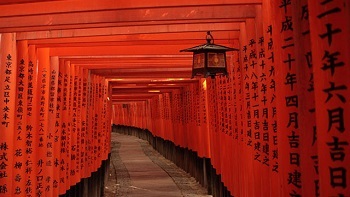 Once you make your way through the crimson red and black Kaminarimon and under the lantern, you have entered Nakamise-dori, or Nakamise Shopping Street, a shopping street of approximately 300 meters, leading up to Sensoji Temple. Nakamise Shopping Street dates back to the late 17th century and is one of the oldest shopping streets in Japan. During those times, locals were granted special permission to open shops along the path to the temple. However, the Nakamise Shopping Street was destroyed by both the Great Kanto Earthquake in 1923 and the raids of 1945. Fortunately, the street was reconstructed and have been filled with shops selling popular snacks, traditional knickknacks, toys, accessories, and lots of souvenirs. 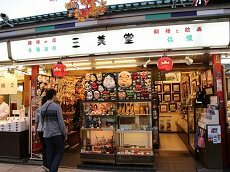 Tourists can stop by the many vendors on their way to Sensoji and try some ningyo-yaki (sweet red bean paste cake), dango (rice cake), senbei (rice crackers), and agemanju (sweet deep fried cakes with filling), just to name a few of the most popular snacks. 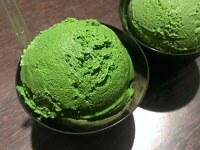 There's even ice cream shops with over 20 unique, yummy flavors including lavender, sweet potato, white peach, and soda. Off the Nakamise Shopping Street, but on temple grounds, visitors will also see a row of street-food vendors offering various types of food, including festival foods such as yakisoba, yakitori, okonomiyaki, and more. A popular activity to do while at Sensoji Temple is to try your fortune with the Omikuji paper fortune. 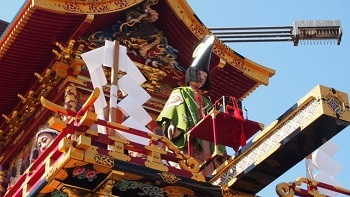 At Sensoji, you’ll see several stands with the letters みくじon the sign. You can go to any of those stands, place a 100 yen coin the money box, and then pick up and shake the omikuji box which should be a hexagonal tin can. In the can are one hundred wooden sticks, and as you shake it, one wooden stick will pop out, which has a number on the end of the stick, written in Japanese. If you have a difficult time matching the number of the stick to the number on the shelf, just ask a local and they’ll be happy to help. Open the drawer with the corresponding number to find your fortune, which will be in both Japanese and English. If your fortune says 大吉 or Daikichi , which means Great Blessing, you have picked the best fortune and may the rest of your trip to Japan be full of happiness! 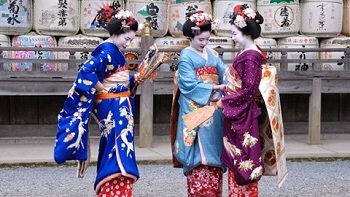 Although Sensoji Temple is a great place to visit during any season, cherry blossom season in the spring is our favorite time to visit. 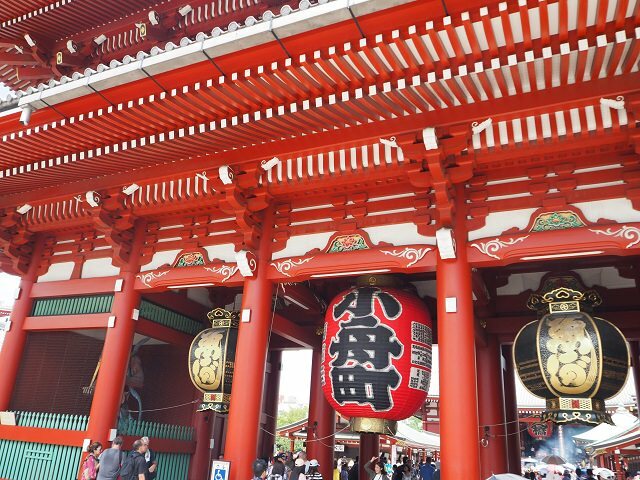 The crimson red and black Kaminarimon and its iconic paper lantern with sakura petals floating in the air is a beautiful sight you won’t want to miss. 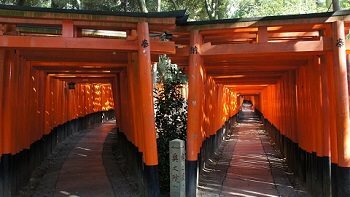 Check out this historical temple and the charming Nakamise-dori for some souvenirs by joining our Cherry Blossom or Anime Tours! 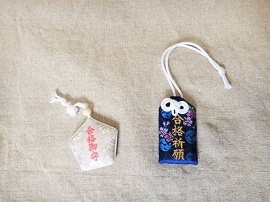 Tokyo shrine that sells special good luck charms for blessing your electronic devices.